Want to be fully pulled into the world of Captain Marvel? The next exciting chapter in the MCU is coming to ScreenX. What is that exactly? We have the stunning trailer, which gives you an idea how this all-immersive format works. And it looks incredible. CJ 4DPLEX, the world's leading cinema technology company, announced today that Marvel Studios' Captain Marvel, is coming to theaters in the ScreenX format on March 8, 2018. Captain Marvel will be the third movie from Marvel to be converted into ScreenX, and the latest collaboration between The Walt Disney Studios and CJ 4DPLEX, following the globally successful ScreenX release of Black Panther and Ant-Man and The Wasp. Captain Marvel stars Brie Larson in the title role and is directed by Anna Boden and Ryan Fleck. 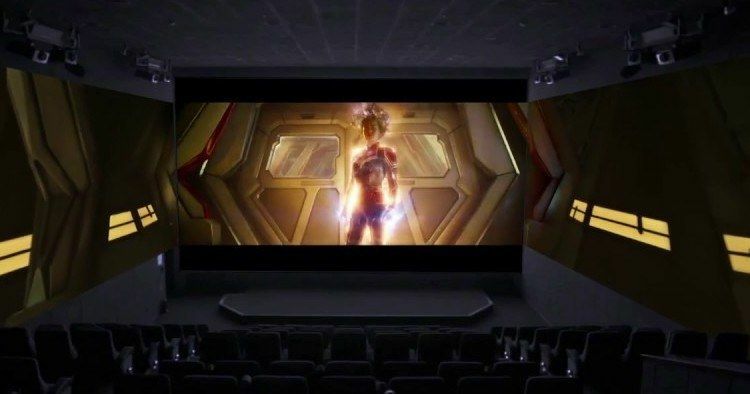 CJ 4DPLEX is introducing Captain Marvel in this fully immersive format. ScreenX is the world's first multi-projection theatre technology that allows a 270-degree panoramic movie watching experience. ScreenX allows the audience to go beyond the frame of the traditional movie screen, utilizing a proprietary system to expand the center screen image to the side walls, surrounding audiences with imagery and providing a sense of being inside the movie. Said JongRyul Kim, CEO of CJ 4DPLEX. "Captain Marvel is another great movie from the Marvel Cinematic Universe that continues to showcase the full potential of the ScreenX format by taking us on an otherworldly heroic journey. We are thrilled to team with The Walt Disney Studios and Marvel Studios to bring this inspiring new heroine to audiences in our newest cinematic experience." Marvel Studios' "Captain Marvel" is produced by Kevin Feige and directed by Anna Boden and Ryan Fleck. Louis D'Esposito, Victoria Alonso, Jonathan Schwartz, Patricia Whitcher and Stan Lee are the executive producers. The story is by Nicole Perlman & Meg LeFauve and Anna Boden & Ryan Fleck & Geneva Robertson-Dworet, and the screenplay is by Anna Boden & Ryan Fleck & Geneva Robertson-Dworet. "Captain Marvel" opens on March 8, 2019 in U.S. theaters.